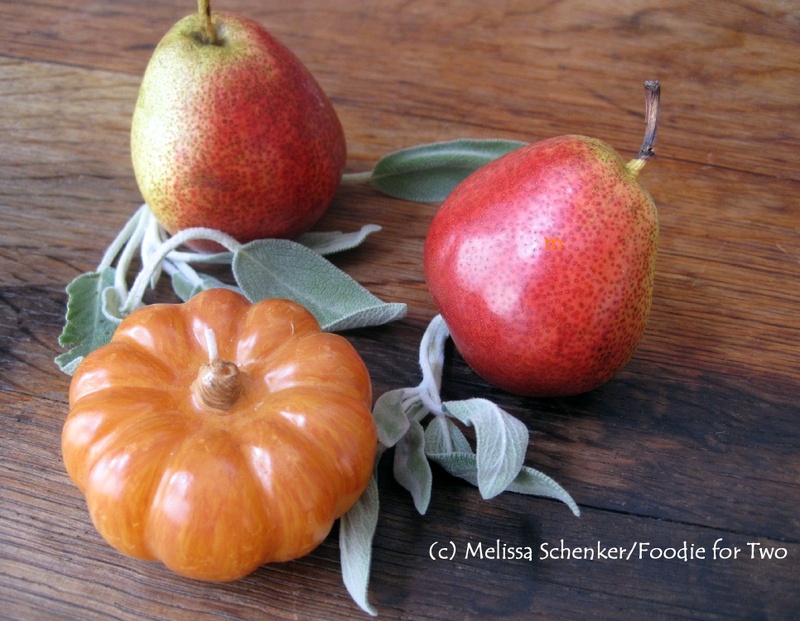 Thanksgiving has always been one of my favorite holidays because it’s a celebration centered on food, traditions (history) and gatherings around the dining room table. I am grateful for many things this season, especially all the readers who follow my blog. I still haven’t run out of things to share with you and I always love to hear how my posts inspired you in some way. Tomorrow the house will be filled with heart-warming smells and there will be plenty of food on the table where we can catch up with loved ones and share in a few heartfelt toasts. 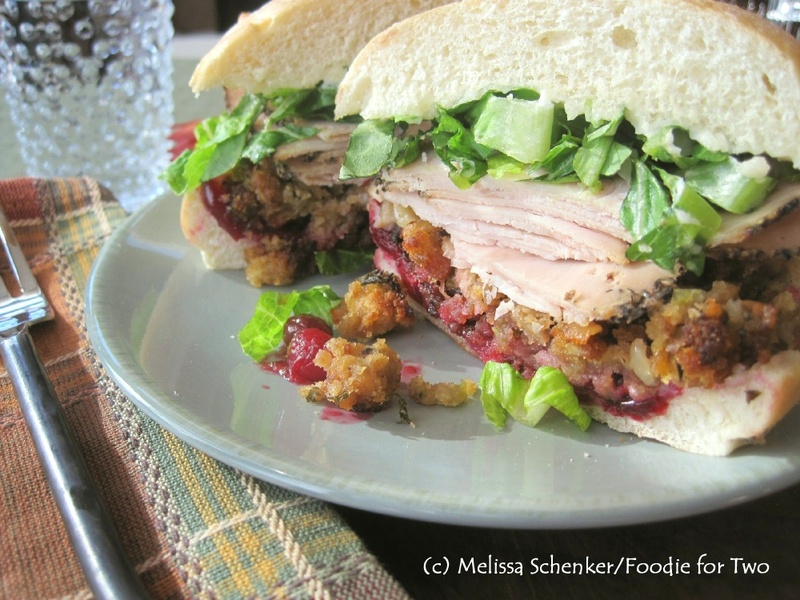 And the next day the refrigerator will be full of delectable leftovers, so here’s a refreshing idea for a simple sandwich (based on a sandwich from Baggin’s in Tucson) to enjoy for lunch over the Thanksgiving weekend. The sandwiches have been our favorite for years and we look forward to them almost as much as we do the dinner! They are made from some of the best of the leftovers. There’s no typed recipe today, so here are the directions: slice and toast a Kaiser roll and dress both sides with some mayonnaise, then layer with some cranberry sauce, warm stuffing (with sausage, of course), turkey slices, chopped romaine lettuce and finish it off with the top bun. There are so many flavors in each bite, it’s creamy, sweet and tart, rich and savory and has a nice crunch from the lettuce. You’ll want to have some lettuce and your favorite rolls on hand so you can use up your leftovers in a new way! Have a wonderful celebration and be sure to tell the person who is next to you how special they are, Happy Thanksgiving! Eat well and share the love! ﻿ Need an idea for what to do with your leftovers from St. Patrick’s Day? 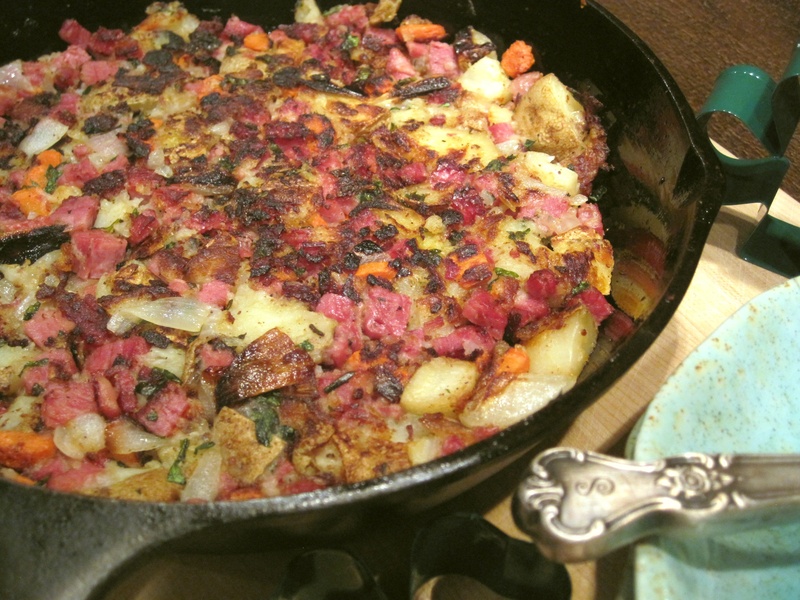 Try this Corned Beef Hash recipe. It is such a delicious treat for breakfast, or even dinner. One of my favorite food indulgences (okay, I have many) are fried potatoes of any kind, including hash browns. I really enjoy the recipe for Corned Beef with Roasted Vegetables from my earlier post and this is a savory extension of that meal. Each of the flavors meld together (the roasted carrots and onions add a wonderful sweetness) and both sides of the hash develop a crispy crust. This is different from hash browns because of all the added goodies and the whole potato pieces; hash browns are typically grated and mixed with eggs and onions, like potato latkes. But like hash browns, the mixture is firmly pressed into the pan and left to cook a bit for a crispy outside. The only vegetable I don’t use from the St. Patrick’s Day meal is the cabbage so be sure to eat it up at dinner. When you cook the hash I recommend using a cast iron skillet or a well seasoned pan to make sure you get a crispy crust; non-stick pans won’t do that for you. The nice thing about a cast iron skillet is that you don’t have to use as high of a heat because it conducts and retains the heat extremely well, and because it’s well-seasoned, the potatoes won’t stick. The recipe calls for some of the cooking liquid because it has lots of flavor, but chicken or vegetable stock would work too. The trick is to make sure the potato mixture is moist so it stays together when cooked. As for the eggs, I will let you choose – prepare them your favorite way. I know it’s unusual for a foodie but I confess: I can’t stand runny eggs, make them over hard and crispy for me, please! I have given up on ordering eggs at restaurants because they are never done enough for me and the server usually looks at me weird when I place the order. As you can see from the picture, we both like our eggs cooked differently. 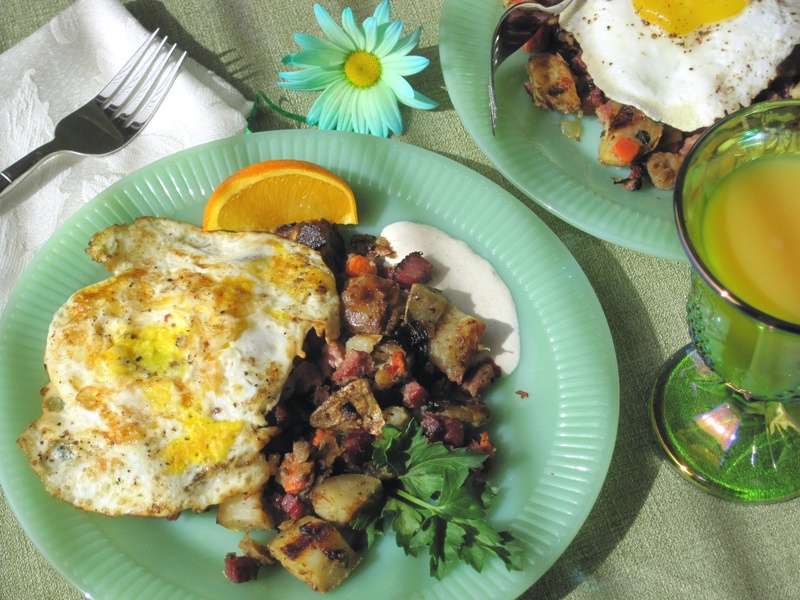 For even more flavor, add a little of the lime horseradish sauce from dinner to eat with the corned beef hash! (pronounced ‘slawn-cha’) – a common Irish toast meaning Health! and is the equivalent to Cheers! Add potatoes to large bowl and mash with potato masher or the back of a measuring cup so three-fourths of the potatoes are broken up. Add the corned beef, 1/2 cup of the cooking liquid, roasted onions, diced onions, mustard, pepper, parsley and carrots (if using) – mix well with a spoon. If the mixture is too dry, add more liquid; you want just enough so the mixture stays together. Heat a cast iron skillet or well-seasoned pan (not non-stick) over medium to medium high heat and melt 1 ½ tablespoons of butter. When melted, add the potato/corned beef mixture and stir around in the butter. Press down firmly with the back of a spatula to form a flat layer. Let cook for about 8 to 10 minutes, moving the skillet back and forth every so often to help form a nice crust. 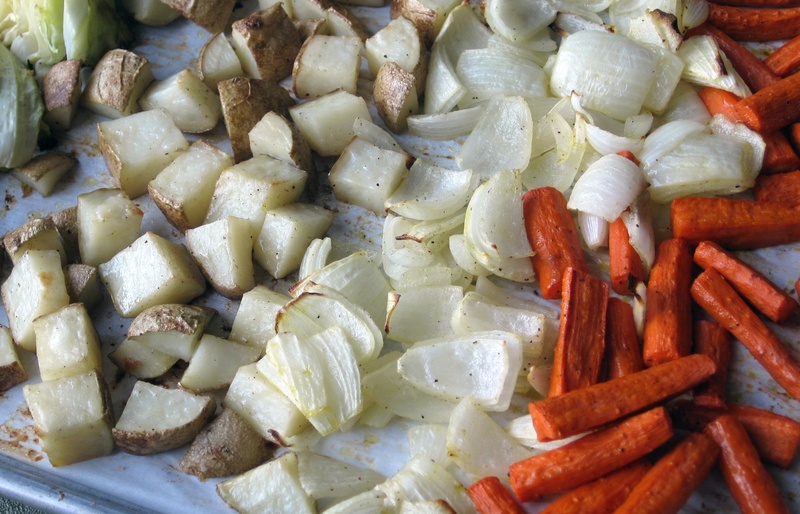 Invert the potatoes onto a large plate or round sheet pan and melt remaining 1 ½ tablespoon of butter in skillet. (Don’t worry if the shape doesn’t hold together. You can fix it when it goes back in the pan.) Slide the potatoes back into pan, browned side up. Press down firmly and cook another 8 to 10 minutes until bottom is brown and crispy. Garnish with chopped parsley and serve with your favorite style eggs. Foodie for Two celebrates the joys of making - and eating - scrumptious food at home, creating recipes for two, and sharing all the adventures along the way. I’m a passionate foodie with some culinary training who is always trying to create and capture that mouth-watering, perfectly styled food photograph. Never miss a crumb! Sign up to subscribe to Foodie for Two via email. You'll always know what Melissa is serving.